The project was focused on Kisumu which is on the shores of Lake Victoria and is the third largest city in Kenya. Surrounding the city are a number of informal settlements that generally grew without urban planning as people moved from rural areas towards the city. As a result of this they often lack basic services like a piped water supply, or the piped water supplies are intermittent and unreliable. This means that inhabitants commonly rely on other sources of water to meet their needs. 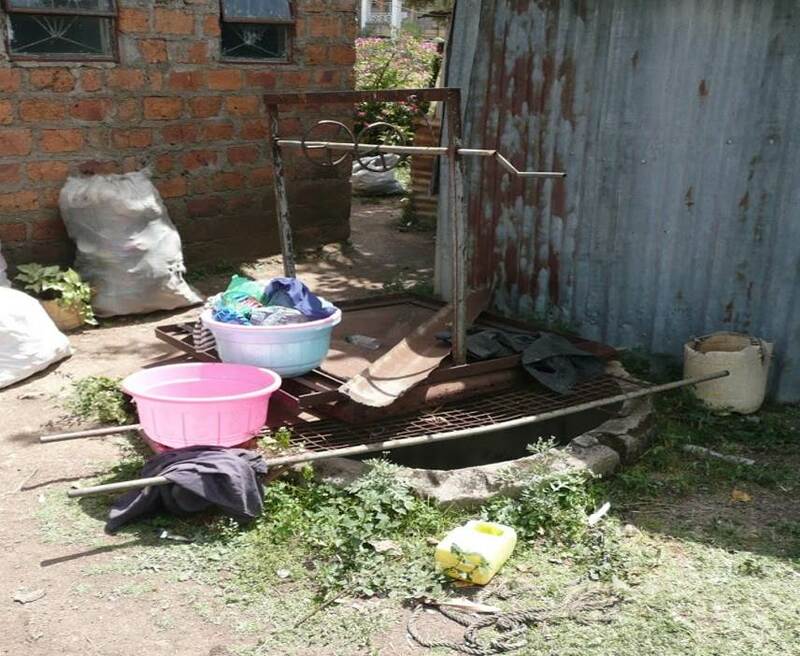 Shallow hand dug wells are found all over the informal settlements in Kisumu and are a main or supplementary source of water for many residents. The average depth of a well is about 6m – the water table is quite high here so they don’t need to be any deeper. These wells provide a vital contribution to the water needed by residents; but where people choose to dig them, how they construct them, and how they maintain them can have a huge impact on the quality of the water they hold. 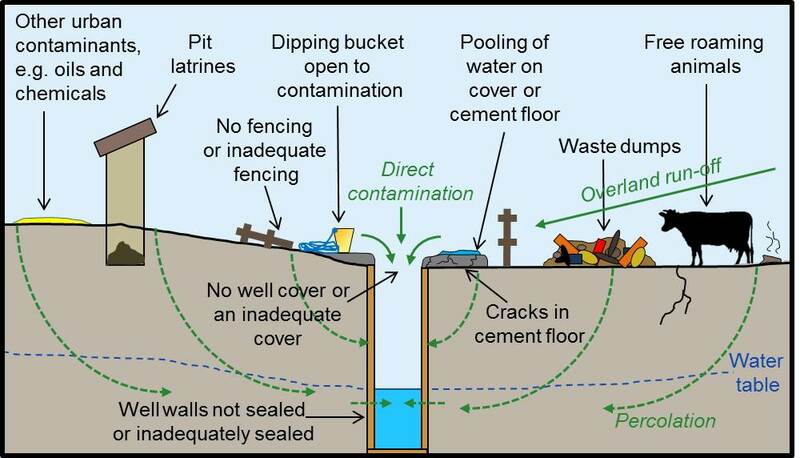 The diagram below shows some of the possible contamination hazards for a shallow well. Broadly, these can be divided into ‘well hazards’ and ‘environment hazards’. Well hazards relate mainly to the construction and maintenance of the well, and include things like whether there is a cover over the well which stops direct contamination to the water. Environmental hazards are related to where the shallow well is constructed and what other activities are happening in the vicinity. The presence of nearby pit latrines and waste dumps are examples of environmental hazards. In two of the informal settlements in Kisumu (Manyatta A and Migosi), we found that the risk of water contamination had increased over time due to an increasing number of hazards. We sampled water from 46 wells in Manyatta A and Migosi to test whether the water was suitable for drinking. We looked at lots of different measures of water quality, but one of the most important was the presence or absence of thermotolerant coliforms (TTC). The presence of TTC in a water sample shows that it has been contaminated by faecal matter and infers that it may contain pathogens. We found that 44 of the 46 wells had a presence of TTC and the water was therefore unsuitable for drinking. This was really worrying, because so many people rely on these wells and the contamination was nearly universal. As well as the water testing, we carried out surveys with well owners and customers to try and understand more about how people were using the water from the wells. We found that the majority of people (87%) that were using well water were not using it for drinking, but for other tasks such as washing clothes and personal hygiene. When choosing the type of water for drinking, water quality and safety were top on their list of priorities, and residents were more likely to use other sources like piped water or rain water. It was reassuring that generally people were making informed choices about the types of water they used for different tasks. However, worryingly there was a small contingent using well water for drinking without it undergoing any form of treatment. Overall, we found that groundwater from shallow wells was contributing a vital quantity of water to residents. Generally, there was an awareness that water from different sources differed in terms of quality, and was used accordingly, which was a very positive finding. However, this awareness was not universal, and future pressures from urban population expansion and climate change are likely to have important consequences for shallow groundwater use in these settlements in the future. Thanks to Jim Wright (University of Southampton, project PI), Joseph Okotto-Okotto (Victoria Institute for Research on Environment and Development (VIRED) International), Lorna Okotto (Jaramogi Oginga Odinga University of Science and Technology) and Steve Pedley (University of Surrey) for getting me involved in the project. If you’d like to find out more about the work undertaken in Kisumu, please see our journal articles, ‘Socio-economic aspects of domestic groundwater consumption, vending and use in Kisumu, Kenya’, and ‘A longitudinal study of long-term change in contamination hazards and shallow well quality in two neighbourhoods of Kisumu, Kenya’. This project was funded through a NERC/ DFID/ ESRC programme; Unlocking the Potential of Groundwater for the Poor (UPGro), grant ref. : NE/L001853/1.